Help Keep Your Neighbors Warm! participants of all ages, abilities, and challenges. The Contoocook Carry Triathlon was first held in 2002 to help build the town's Spirit Skateboard Park. This year, our mission is to give 100% of all proceeds directly to Fuel Assistance (sponsored by the Contoocook Carry Community Fund) to those who might need a little extra help this coming winter. Our spirit has always come from outstanding athletes, families, teens trying to out do their parents or each other, and other adventurous people, just testing their mettle. This event happens each year only because of the amazing volunteers from our town: The Hopkinton Police; Hopkinton Rescue Squad, Select Office, High School's Interact Club, Rotary; First Congregational Church; The Lions Club; and many individual volunteers... all joining hands to support this cause. The "Carry" begins from Hopkinton High School with a 2 mile run to the bank of the Contoocook River and a beautiful view of Putney Hill. After putting your boat in the water, you'll paddle about a 1½ miles to the portage, just above the dam and bridge in the Village of Contoocook. You and your boat will portage about 200 yards (help to carry your canoe is available) to return to the river. You paddle about 4 miles to the Tyler Bridge, at which point you will begin the 14 mile bike through the lightly rolling country back to high School. Join us for the fun, help warm some hearts and carry the load. You get more information about our efforts at "About Us". You can also read more about the community effort to supply fuel assistance through the Contoocook Carry Community Fund and the Sean Powers Wood Bank. "It can be determined as a race, or 'race' can be a loose term. We have children, families, anyone can do this race. It is a physical event that people do and they feel satisfied because they know every penny is going into the fund." Race organizer Mary Congoran, on The Contoocook Carry, which raises money for fuel assistance. 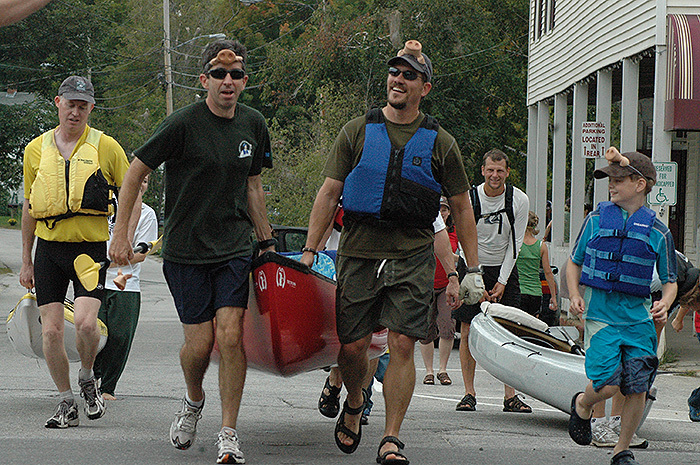 Contoocook Carry, which raises money for fuel assistance. Contoocook's unique triathlon has a greater good. Other news articles about the race. Read the Bow Times Article. Read the New Hampshire ToDo Article. Help Carry the Load and Warm Some Hearts!